Fans of Conan can breathe a sigh of relief today because Brett Ratner is no longer directing the upcoming reboot. Empire Online reports that the Rush Hour director has been removed of his duties because of timing issues. The magazine spoke with "Conan" and "Red Sonja" producer Joe Gatta and he revealed the timeline for the project and status of finding the lead and a new director. Joe Gatta explained why Ratner was off the project to Empire. He said, "For the past six months we were discussing the movie with Brett Ratner, and for more timing issues than anything else we had to part ways with Brett." Whatever the reason, thank God! Ratner is a ham of a director and should stick with lighter fare of films like his franchise Rush Hour. He tried his hands at a branded franchise, failed miserablely and should never be allowed to tarnish one again. Gatta would like to get "Conan" moving very quickly and talked about a time table for the film. "We have a potential start-date on Conan of August 24. And we’ll be shooting in Bulgaria." He also said they are currently looking for a new director. The hope is that "Conan" will be a huge success so that they can setup "Red Sonja" and "Thulsa Doom." Gatta explained, "I would say though the emphasis is on Conan [rather than Red Sonja]. It’s our crown jewel here at the company and that will be the leader. Red Sonja probably won’t happen until next year, as far as making it goes. So we want to launch Conan and reinvent the franchise." In order for "Conan" to be a success, one would think a strong actor is needed in the title role. Joe Gatta informed Empire they would be looking very soon for the right Conan. "We’ll have an open casting call: as soon as we hire our director the search is on." Let's just hope we don't see John Cena or some other crappy WWE star cast! 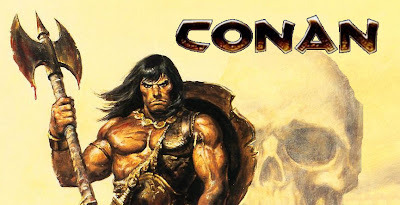 I love the original Conan films and I really hope the re-boot is done right.